SANTA MONICA, Calif. (October 22, 2015) – Following an impressive stoppage during the main card of the groundbreaking “Bellator MMA: Dynamite 1” card in September, Josh “The Punk” Thomson (21-8, 1 NC) will make his main event debut against Pablo “El Gallo” Villaseca (10-1) on Friday, December 4 at The San Jose State University Event Center. 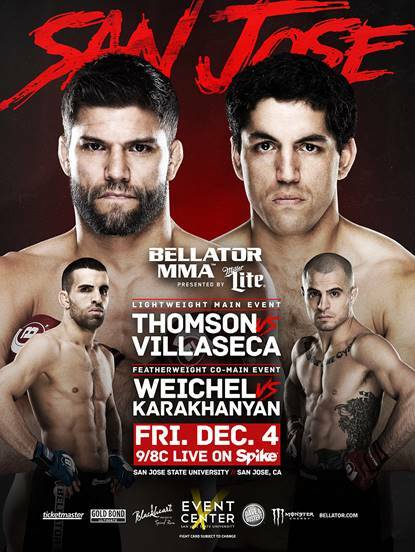 In addition, the co-headliner of “Bellator 147: Thomson vs. Villaseca” will feature a marquee featherweight contest, when Georgi “Insane” Karakhanyan (24-4-) goes toe-to-toe with Daniel “The Weasel” Weichel (35-9). The pair of contests will air live on Spike at 9 p.m. ET/6 p.m. PT, while preliminary bouts will stream on Spike.com at 5 p.m. PT. Tickets for “Bellator 147: Thomson vs. Villaseca” go on sale this Friday, October 23 at 10 a.m. PST and will be available at the San Jose State University Event Center Box Office, as well as Ticketmaster and Bellator.com. Ticket prices start at only $30 and doors for the event open at 4 p.m. local time, with the first bout taking place shortly after. 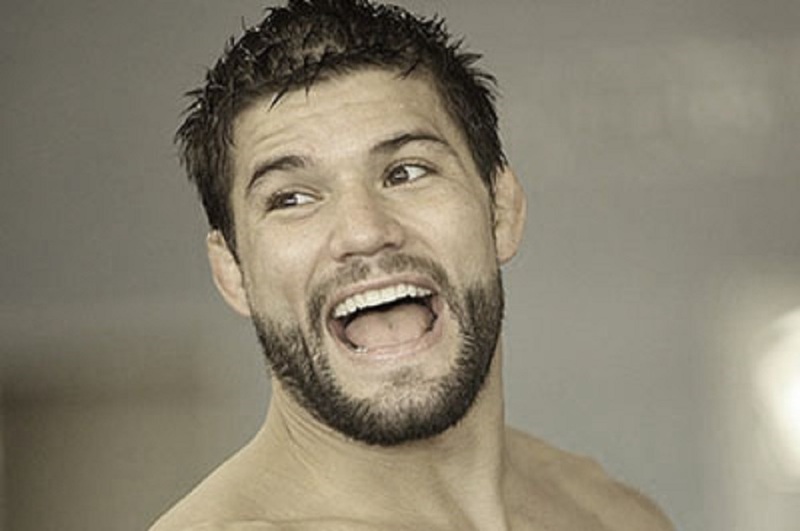 After choosing to sign with Bellator MMA following runs in Strikeforce, Pride Fighting Championships, and the UFC, Thomson impressed on his home turf with a third-round arm-triangle choke submission of Mike Bronzoulis on September 19. Escaping injury free, the American Kickboxing Academy standout returns to action before the year’s end, with lightweight title aspirations on his mind in 2016. Making his return to the Bellator MMA cage following an injury ahead of what was slated to be his shot at Patricio “Pitbull” Freire’s 145-pound title at “Bellator 138: Unfinished Business,” Karakhanyan will look to solidify his role as the undisputed No. 1 contender when he makes his sixth appearance for the Scott Coker-led promotion since 2010. A product of Millenia MMA in Rancho Cucamonga, CA., fans of “Insane” won’t have to leave the state to see their guy fight on December 4. There wasn’t much doubt that Weichel was defeating “Pitbull” before getting caught with a perfectly placed punch in the second round. Now, the road back to the featherweight title leads directly through the man who was supposed to compete for the championship before withdrawing due to injury. A native of Germany, Weichel has only tasted defeat twice in 14 fights, competing for promotions around the world the likes of M-1 Global and Shooto. At only 30 years of age, Weichel has already amassed 35 victories, stopping his opponent in 26 of them.